During the American Civil War, the Union soldiers blocked supplies to the Confederacy. Due to this there were mass shortages and the newspaper offices ran out of paper. The scarcity of paper forced editors into being resourceful and to find other means of publishing, which they did. They used wallpaper to print their newspapers (this was not ripped from parlor walls as some books mistakenly state, but rather new rolls of wallpaper were used). 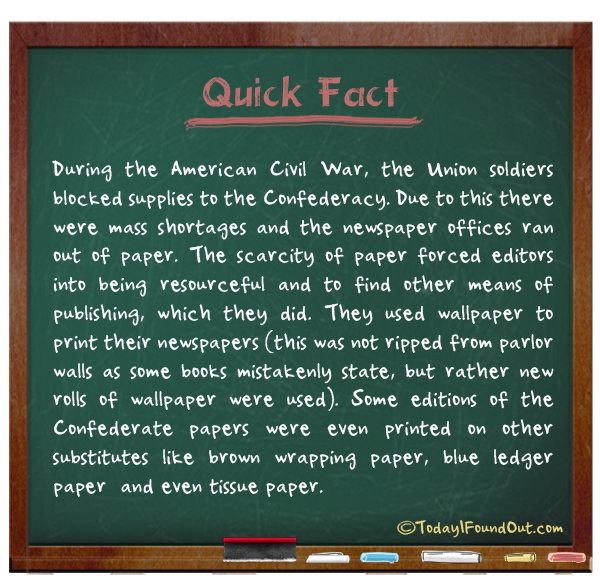 Some editions of the Confederate papers were even printed on other substitutes like brown wrapping paper, blue ledger paper and even tissue paper.